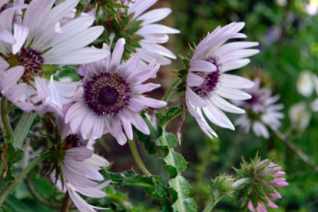 Fascinating daisy from South Africa with intensely thorny, conspicuously ridged stems and throughout summer a long display of large light purple to white daisies. The interior of the flower is much darker than the petals and provides great contrast. Each 4″ wide flower faces outwards and is easy to see. To 30″ tall from a slowly spreading clump. Rich, well drained soil with regular summer water. Drainage is important but so is good care during summer to establish an extensive root system. Excellent on sunny slopes. Add a yearly application of compost to spur vigor and blooms. Full sun to very light shade. All together a very spectacular perennial. Worth the effort to make it happy. Very unusual cut flower. Completely winter deciduous. Rated as zone 6, In our observations over the years it is more like the low end of zone 7. Mulch in autumn. Moderate deer resistance.